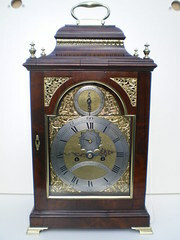 Fine quality early19th century library or bracket clock by Rowell from Oxford. Rosewood and brass inlaid chamfered top case with gadrooned decoration and bun feet. 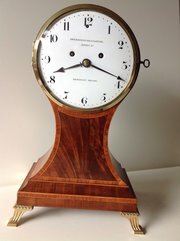 4.5" silvered and engraved dial marked with Roman numerals and the makers name. Blued steel moon hands. Locking glazed front and back doors. Chain fusee anchor escapement timepiece movement with shaped plates. Probably George Rowell, 1770-1834. Early 19th century twin fusee balloon clock by Dwerrihouse and Carter, Davies street, Berkeley square, London. 8 day twin fusee movement striking the hours on a bell, with strike / silent facility. 6" diameter white porcelain dial with Arabic numerals and blued steel hands protected by a cast brass locking glazed bezel. Harewood, kingwood and mahogany veneer case with delicate line inlay. Dwerrihouse and Carter are listed as working in Davies street 1802-1823. 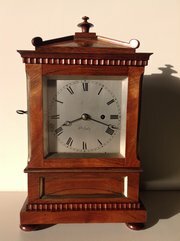 Early 19th century lancet cased single fusee bracket clock by Peter Vigne and Benjamin Lautier from Bath. Mahogany veneer case with brass mounts and unusual raised brass inlay. 4" convex porcelain dial protected by a locking cast brass glazed bezel. Fine quality small single fusee movement by Thwaites and numbered 4010, dating it to 1807. The engraved and shaped shouldered backplate marked Vigne and Lautier. Look closely at the name Lautier on the dial, it has been mistakenly marked "Lawtier" which has been scratched to try to remove it! 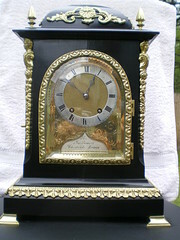 19th century ebonised case single fusee library clock by George Philcox, Southwark Square, London. The 4" square silvered and engraved dial is marked Philcox patent no. 107. The moon hands are blued steel. The ebonised "5 glass" case has locking front and back doors. The chain fusee movement has maintaining power and still retains its original lever platform escapement. George Philcox worked in Southwark Square 1839-1878, he is recorded as dying in the Watchmakers asylum, New Southgate. He registered several patents regarding the improvement of timekeeping via escapements and compensation. 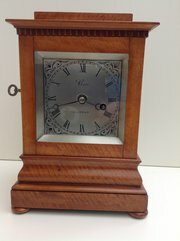 Early Victorian single fusee satinwood, "5 glass" library clock of small proportions by Cox from London. 4" engraved and silvered dial with finely pierced moon style hands. Nicely figured satinwood case with bun feet. Locking front and back doors. Bevelled glazed side and top windows. Chain fusee movement with anchor escapement. "London" regulating pendulum. 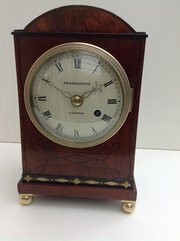 Early 19th century library clock of small proportions by Dwerrihouse, from London. 4.25" convex, original white painted dial with roman numerals and delicately pierced brass hands protected by a convex glazed locking engine turned bezel. Mahogany case with brass ball feet. The front and sides inlaid with brass and ebony line decoration. Fishscale frets to case sides. With locking glazed rear door. Line fusee movement, the backplate engraved Dwerrihouse, London. 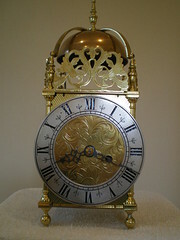 Eighteenth century, bell top cased bracket clock by Charles Wrench from London. Finely figured mahogany case, with brass carrying handle, cast brass ogee feet, and cast brass apron below carrying handle. Brass dial with cast brass spandrels. Silvered brass chapter ring and subsidiary strike / silent and calendar dials. Note the unusual calendar dial. 8 day twin fusee verge escapement movement, striking the hours on a bell, with repeat cord,. Blued steel hands. Finely engraved backplate. Charles Wrench was apprenticed in 1769, and was a member of the clockmakers company from 1785-1820. 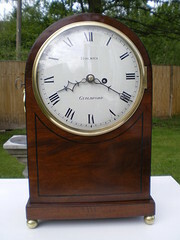 Early 20th century lantern clock with fusee movement and passing strike. 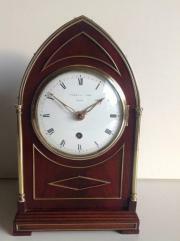 Early 19th century single fusee bracket clock by John Holmes from Guildford, Surrey. Mahogany case with ebony edge lines and brass lion head handles. 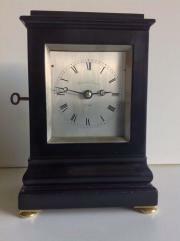 Edwardian 8 day bracket clock in an ebony case with gilded brass mounts. Silvered and engraved brass dial with retailers name in a cartouche, Sir John Bennett, Cheapside, London. Press catch opens bevelled glass front door. Locking back door. Movement by Lenzkirch, and numbered 1,462,970, dating it to 1906, strikes the hours and half hours on a coiled wire gong.